The perfect gift! 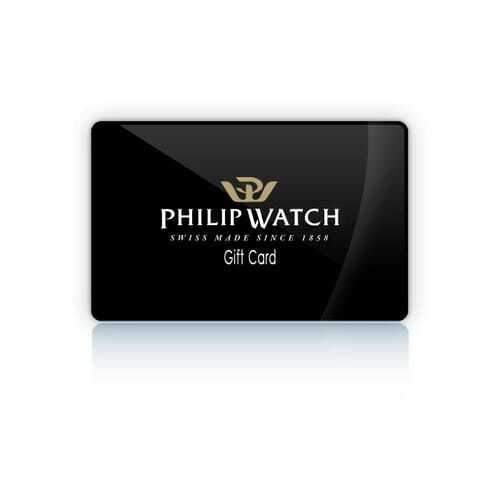 The Philip Watch Gift Card is a digital card that gives the recipient complete freedom of choice of products to purchase and is valid for 12 months. The amount of the Gift Card covers the entire order, including shipping costs, and can be used for different orders while the credit lasts. Please remember it can only be used at philipwatch.net . You can purchase the Gift Card without indicating the recipient: in such cases, the email with the card details and the printable pdf will be sent to the email address entered on the order page. As an alternative, if you enter the name and email address of the person you are sending the gift to, all the information will be sent directly to the recipient, who simply has to confirm receipt of the Gift Card. In this case you can select the date on which the mail with the Gift Card details is to be sent.